On February 15, 1942, the 6th Armored Division was officially activated in a brief ceremony held at Fort Knox, Kentucky, the home of the Armored Force. Major General (then Brig. Gen.) William H. H. Morris, Jr. was designated as Division Commander. 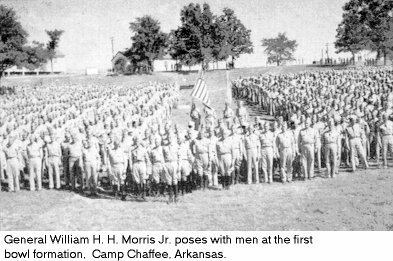 In a very short time, the division staff of 2,601 officer and enlisted cadremen, predominately cavalrymen chosen from the Ist and 2nd Armored Divisions, were on their way overland to a new army camp which was to be their home for the next six months-Camp Chaffee, Ark. Nearby was the friendly city of Fort Smith, whose citizens extended a warm welcome to the men of the 6th Armored Division that was never to grow cold. By the middle of March, all of the cadre had arrived from Fort Knox, the camp had been put into operation, and everything was in readiness to receive the new men who were to make up the 6th Armored Division. The first trainload arrived at Camp Chaffee on 26 March, climbed off the train, and stood shivering in the Arkansas cold before they were hurried off to the big gymnasium where an elaborate set-up had been made for their interviewing, classifying, and assignment to one of the many regiments, battalions, or separate companies that made up the old "heavy" armored division. By the next day the "recruits" began pouring into the division in ever increasing numbers until by, the 15th of April the quota of over 15,000 men had satisfied the ever-present "T.O." Soon the training of the new men was well underway in basic training and the many technical phases that made up armored operations. Men were first trained as soldiers and then as tankers, engineers, medical technicians and ordnance experts. Soon field exercises were being held and overnight problems called through the near-by countryside. The training for the business that lay ahead was punctuated only by an occasional dance or party given in camp or in Fort Smith. Then came August, 1942, and with it plans for the Division to maneuver in Louisiana. Late in the month saw all the wheeled vehicles on the road headed south for the maneuver grounds in the vicinity of DeRitter and Alexandria, while the track vehicles went by train. The mock warfare began right away. It was excellent training for combat -- the almost constant rain made a quagmire of the terrain once vehicles left hard roads; the mosquitoes became legendary; the chiggers and the wood-ticks contributed their part to life in the field; and men got their first samples of "C" rations. Maneuvers continued until the last days of September. Men learned to drive heavy combat vehicles by starlight and follow tiny, elusive blackout lights of those ahead over dusty trails. Filling Station operators, bankers and insurance salesmen became soldiers. And then the Division returned to Camp Chaffee. At this time a change was made in the division artillery. The 59th, 69th, and 93rd Artillery Battalions, forming a group, were detached and three new ones -- the 128th, 212th, and 231st battalions were assigned. The stay at Chaffee was brief. The "clean-up" program following return from maneuvers was hardly finished when the Division received orders to entrain for California -- a program of desert maneuvers was in store for the Division that was now known as the "Super Sixth". Units were alerted for movement to the Desert Training Center, that section of eastern California adjoining the sands of the Mojave Desert. Division Headquarters pulled to a jerky stop by a little shack labeled Freda, California, on the 10th of October 1942, and unloaded vehicles on the siding for the short ride to the Division Assembly Area at Rice. The dust of the desert floor, face-powder thin, mushroomed in clouds at the touch of a foot; the temperature soared to astronomical heights; construction of the tent city that was to mark the home of the Division for more than five months began. Other units of the division assembled hourly. Further training in field exercises began right away for the Division; overnight problems gave experience in mastering desert terrain and use of maps and compasses; the Division constructed firing ranges and gained its first experience at anti-aircraft firing. Full scale maneuvers came early in 1943, the Division acquiring valuable experience and "winning-out" over another armored outfit which later proved a famous running-mate in Europe: the 4th Armored Division. Maneuvers came to a close; men took their last look -- at beautiful desert sunsets, at the blue haze that enveloped the desert floor in early morning, at the stars that provided a ceiling for their outdoor movies in the cool evenings. On 15 March, the Division units, less vehicles, were on their way to Camp Cooke, on the California coast. Division Headquarters opened its doors on 17 March. Other units detrained rapidly. Men of the Division settled down to another program of the routine training that made up most of their wind-swept,ten months stay at Camp Cooke. Some phases of training had a new twist to them: practice in "street fighting"; close infiltration course under live ammunition; judo; swimming tests at Santa Barbara; extensive training in reconnaissance work; more days on the firing range. This was followed by a field exercise lasting nearly a week. The Division had changed Commanders, and General Morris was replaced by Major General (then Brig. Gen.) Robert W. Grow, who assumed command of the 6th Armored in June, 1943, and who was to guide the Division through the war. In September, the division underwent reorganization, and was changed from the "heavy-type" to the newer "light-type" division of approximately 11,400 officers and men. The Supply Bn. was relieved of assignment, together with Division Service Co., one Engineer Co., and three tank battalions. AGF tests were completed. The 6th was ready for overseas service. The Division was alerted for shipment in January 1944. The 25th of January saw Division Headquarters and other units pulling out for the east coast, less equipment, other than personal. The Port of Embarkation was Camp Shanks, New York, and the stay was brief. In approximately a week's time, the Battalions and separate companies of the 6th were processed and issued extra equipment, and then boarded ships in New York harbor. The 10th of February saw the Division troops on the high seas, sailing in one of the largest convoys of the war. The ships docked at Liverpool, England, and Glasgow, Scotland, after a voyage lasting around twelve days. Division Headquarters anchored in the harbor near Glasgow on 22nd February, and debarked 25th February. The troops entrained and reached Gloucestershire and Oxfordshire, England, that night. 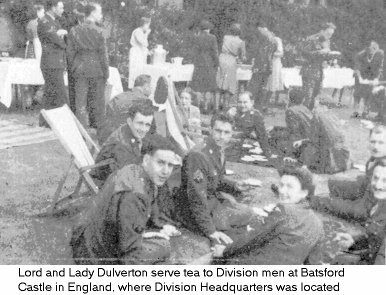 Division Headquarters was established in Batsford Park, Moreton-in-Marsh, and Division units were billeted in and around small villages in the Oxford-Stratford on Avon-Cheltenham area of England, where they were to remain over four months. Here the Division met new customs, new people, new traditions. Men grew accustomed to warm ale, tea, "fish 'n chips", and found a few hours for-sightseeing trips. Training continued; another round with range firing; practicing in Wales, and exercises at Salisbury Plains; one more Division CPX. would he put to the test. shores of France and destiny. 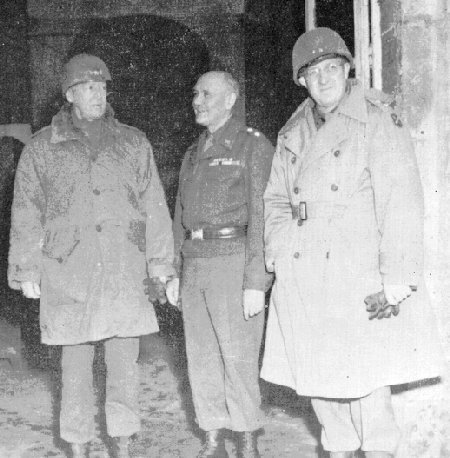 General George S. Patton, Jr., Commander of Third U. S. Army, above left, is pictured with Major General Robert Grow, Commander of 6th Armored Division, center, and Major General Manton S. Eddy, Commander of XII Corps, right, at Division Headquarters near Nancy, France, just prior to the opening of the offensive on November 8, 1944. Return to 6th Armored home page. NOTE: Remove question mark from email address below when sending email.